I was in Northern California to climb some P1Ks in the Coast Ranges found along SR36 between Red Bluff and Eureka on a four day roadtrip. I had spent the second night parked around 5,000ft near Horsehead Mtn which had been the last summit I'd visited the day before (and incidently, is the triple point where three National Forests meet - Mendocino, Six Rivers and Shasta-Trinity). I was up early, breakfasting while I drove the van back down the mountains to the Waterspout TH near the end of the pavement on Forest Road 27 at a saddle. There were several USFS Hotshots trucks parked there, taking up pretty much all of the parking at the small turnout area. I parked up the road a short distance and headed off on the trail shortly after 6a. 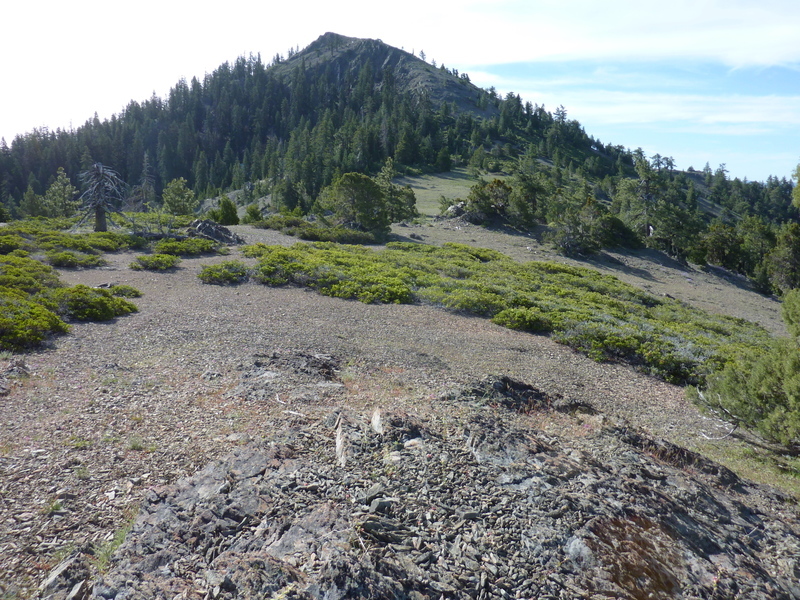 My goal this morning was Shell Mtn, a P1K about 6-7mi inside the Yolla Bolly-Middle Eel Wilderness. The trail drops gently about 300ft over the course of a mile and a half to the North Fork of the Middle Fork of the Eel River (that's a mouthful) before climbing 200ft over a similar distance to Sulphur Camp, passing by several trail junctions. The camp area was occupied by the USFS crew, about a dozen all told, who were breakfasting when I came by not long after 7a. They had small tents and simple bedrolls parked all over a sloping meadow found here. They were in the area doing trail maintenance, mostly clearing downfall from the winter season. We talked briefly, after which they helped me find the continuing trail, now heading north. Up until this point the trail is well-defined and easy to follow, but once past Sulphur Camp it grows thin and the various cairns I noted along the way were helpful for keeping on the right track. The trail begins to climb up Doe Ridge, which eventually connects with the NW Ridge of Shell Mtn. The trail travels variously through forest and brush, more of the latter as one gains elevation. Lupine and other flowers were found blooming in abundance in places where the forest had left large openings. A few large junipers can be found adding accent to the ridgeline as views open up with increasing elevation. The trail follows the ridgeline until it reaches a shallow saddle just northwest of the summit. Here the trail traverses the north side of the peak, requiring a last short stretch of steep cross-country to reach the summit. No register, but a small cairn and views open in all directions. As I was heading down from the summit I heard voices and caught sight of half the trail crew marching off along the trail below me, already on the section traversing Shell's north side by the time I reached it. If they saw me coming down, I had no indication of it as my wave was not returned. I returned back through a nearly deserted Sulphur Camp after 10a, save for the camp manager who was busy tidying things up. It was 11:30a by the time I returned to the Waterspout TH and the van (the name "Waterspout" refers to a spring found on the west side of the road and TH, in the headwaters of the Mad River, not along the trail I followed across the Eel River). I spent almost two hours driving less than 30mi between Waterspout TH and Mad River Ridge. The ridge separates the Van Duzen River drainage to the west from the Mad River drainage to the east. The highpoint of this 25mi-long ridgeline is an officially unnamed P1K (called Mad River Ridge here and on LoJ), found above and just south of Ruth Lake (Mad River Rock, which I climbed the previous day, is the highpoint of the northern half of this ridge). I had tried to reach the highpoint from the north the previous day, but was stopped by private property. I discovered there is legal access from the south where all is USFS land. Forest Road 2S05 runs for more than 10mi along the crest of the ridge, decently graded for all vehicles. There are three roads that reach the crest from the Mad River side: 2S12 at Cedar Camp Rd, 3S05 just west of Ruth Airport, and 3S13 south of the airport. Not knowing my options ahead of time, I picked the longest route using 3S13 which meant I got to drive most of length of the crest. At least the views made it worthwhile. The quickest route uses 2S12, though getting across the Mad River at Cedar Camp Rd may be tricky (or impossible with high water). I eventually found myself to a narrowing road between Hettenshaw Peak and the Mad River Ridge highpoint. I parked here and used the mountain bike I carried with me to ride a rougher dirt road continuing along the crest towards the highpoint for another mile and a half. Later I discovered I had missed a turn in the van that would have let me drive almost to the very top. It mattered little, though, as I was glad to get a chance to exercise my legs after so much driving. I found the highpoint is not so easy to find. There is a point to the north that LoJ had identified, where the topo map shows a spot elevation of 4743. I visited this point first and noted the elevation on the GPSr before exploring a second, similar contour about half a mile to the south that seemed to be 10-15ft higher (this is the spot that LoJ now identifies as the highpoint). I explored this long stretch of ridgeline before satisfying myself that there weren't any hidden, higher spots that I might have missed. I returned to the van to guzzle some Gatorade before riding west to Hettenshaw Peak. This road, Forest Road 2S30, is not suitable for all vehicles, but easily ridden on the bike. I rode only half a mile before realizing that past a saddle the road traverses the north side of Hettenshaw. I left the bike on the road and headed cross-country up steep but manageable terrain to the top of Hettenshaw in about 20min. The rocky summit provides good views for 180 degrees, much better than those from Mad River Ridge. There is also a 1948 USFS survey marker embedded in the rock. I headed back to the van and proceeded to drive south on the main road along the crest, tagging two easy bonus peaks along the way that I had passed by earlier. The first of these was Smith Peak, a cross-country jaunt that took all of 20min roundtrip. No views at the forested summit. Peak 3,949ft proved nearly identical in terms of effort and views. Following this second summit, I drove back down via 3S05. At the bottom of the grade I should have turned right to return to the pavement, but instead I turned left and drove north to explore a small summit called Perrys Knob along the Mad River. I gave up without really trying when I discovered the base seems to be all private property. Needing to get over the Mad River to return to the pavement, I went over a wet, rocky crossing that nearly left me stranded in the middle of the river. I was surprised to find it as deep as it was and the van nearly lost traction as it bumped and ground its way across. I left at least one splash guard in the river on that effort, only discovered a few days later when I was surprised at the damage I'd caused. The van is a trooper, though, and kept humming along. I drove back to Ruth where I picked up more gas and soda, then drove back out to SR36 to the north, a long drive through forest and the east side of Ruth Lake. Once on the highway, I headed west to tackle one last P1K, unnamed Peak 3,960ft. It was after 6p before I found my way up a gravel/dirt road to the west side of the summit where a gated, gas pipeline road runs up along the crest and over the summit, a distance of about 2.5mi. The initial road looked steep so I decided to go on foot rather than bike, but afterwards I concluded the bike probably would have been faster since the steep parts were all in the beginning. In any event, I still had the energy for a five mile hike and enjoyed the stroll along the ridge in the late afternoon with the mellower sunlight filtering through the trees. There were green meadows and wild irises to brighten the scenery, and all around it made a very pleasant end to another long day. No views at this non-obvious summit.